"How to Design and Build with Local Natural Materials"
Join us for an afternoon presentation on modern natural building techniques! Today's methods are are feasible, affordable and quite easy to incorporate. Elliott Ridgway, owner of Golden Home Design, will share slides showing construction of earthen ovens (also known as cob ovens), saunas, a timber-framed temple, straw-bale homes, a straw-bale library and more. Ridgway's presentation will illustrate a wide array of the current techniques being used for less toxic and more sustainable homes and structures. Natural building can incorporate recycled and reclaimed materials along with local natural materials, to create low cost, low ecological-footprint projects. Elliott Ridgway is a Seattle native who has designed and built numerous salvaged and natural material projects. 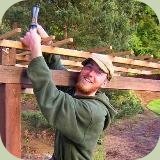 He is the owner of Golden Home Design, providing design, consultation, and construction services with an emphasis on natural building and sustainability while specializing in the use of local, sustainably harvested, recycled, and reclaimed building materials for new construction and remodels. Elliott has traveled the world for environmental, political and natural building causes. 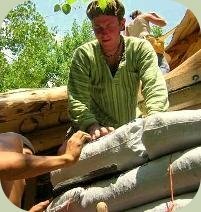 Elliott assisted with the first straw-bale public library in the United States and built a cob oven to feed hundreds of volunteer organizers at the World Social Forum in Porto Alegra, Brazil for a total cost of $1.50 in materials. Interested in in-depth training in sustainable design and nature skills? 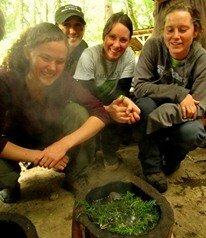 Check out the Alderleaf Wilderness Certification Program.